The proposed increase in Holyrood's tax powers will not help boost Scotland's lagging growth rate according to economic advisers to the Scottish government. In its annual report, the Council of Economic Advisers said business tax rates should be devolved. It also called for the welfare system to be controlled in Scotland. The report said this would ensure that benefits and training could be aligned, as well as cutting out inefficiencies. The committee of business leaders and economists has called for measures to boost competition between Scotland's banks, adding to the pressure on the Office of Fair Trading to look into the dominance of Bank of Scotland and the Royal Bank of Scotland. It also criticised local councils for the speed of their planning decisions, saying central government, by contrast, has responded to previous calls for the system to speed up the process in order to help business investment. Chairman Sir George Mathewson, the former Royal Bank of Scotland chairman, said the council had looked at the newly proposed tax powers for Scotland but that "far more substantial devolution is desirable to provide levers for economic growth". He said: "The climate in which we have been operating has presented many challenges. "The recovery is fragile and what will happen in Scotland in the near future depends very much on the strength of the global economy as well as the impact of austerity measures imposed by the Westminster government". The Council of Economic Advisers was appointed by First Minister Alex Salmond in 2008, and has produced three annual reports. It has no further work, until a decision is made on its future by the administration formed after next May's election. Council member Jim McColl, the entrepreneur who heads Clyde Blowers, argued Scotland suffers from a lack of level playing field when the tax system is unified, but competitor companies in the south-east of England benefit from proximity to markets and more transport investment. He said Scotland should have its own export credit guarantee scheme, to help firms compete with continental European and Canadian companies, and that Scotland's low level of research and development could be tackled with devolved powers over the allocation of tax breaks and incentives. Professor Andrew Hughes-Hallett, a leading economist, strongly criticised the tax powers proposed by the UK government in the new Scotland Bill. He said they provide no incentives for the Scottish government to use them, that they lack sufficient borrowing powers and leave too much of the detail to be decided by the Treasury in London. The Council of Economic Advisers has looked over its three years at the education system, and concluded that a priority has to be made of teacher education. 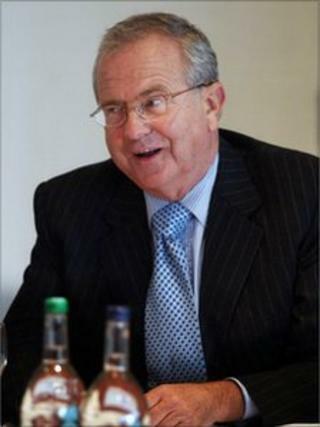 Sir George Mathewson commented of Scotland's schools: "We're not as good as we should be. "It's not because of lack of funds. "The class numbers are not as significant as some would have you believe, and we're in favour of the chartered teacher reforms. "There cannot be too much focus on teacher quality. There are obstacles within the profession and within politics to improving it, but it should be an overwhelming goal for those in government." Asked about the lack of competition within the banking sector in Scotland, Sir George Mathewson countered the banks' claims that they are open for business, saying there is "too much anecdotal evidence" of firms facing high financing charges. As someone now involved in smaller businesses, the former bank chief joined Mr McColl in criticising the cost of renegotiating bank covenants, with one-off fees and sharp increases in interest rates. Sir George said the consortia of banks in "farmed out" financing deals has also worked against the interests of companies in helping to grow the wider economy. Mr Salmond welcomed the recommendations. He said: "We are prioritising our efforts to increase employment, strengthen education and skills, and promote new business growth. "The natural next step is to give the Scottish Parliament the levers needed to grow our economy. "This combined with the great wealth of natural and human resources we have at our disposal would further drive this growth. "We continue to be aided by the council, particularly in long-term strategic planning, and we look forward to responding in detail to the various recommendations made in the report." However, Labour's finance spokesman Andy Kerr said: "If Alex Salmond wants control over business taxes he needs to explain what he intends to do with them. "It is a dishonest con trick to simultaneously criticise the UK government for cutting too fast and too soon, while sending signals to the business community that if corporation tax was devolved they would be even more right-wing than the Tories and cut even further."